News has been swirling lately of an X-Force movie being the follow up to Deadpool 2, teaming Ryan Reynolds' "Merc with the mouth" with the soon-to-be-introduced Cable and Domino. But for the uninitiated, just who are X-Force? 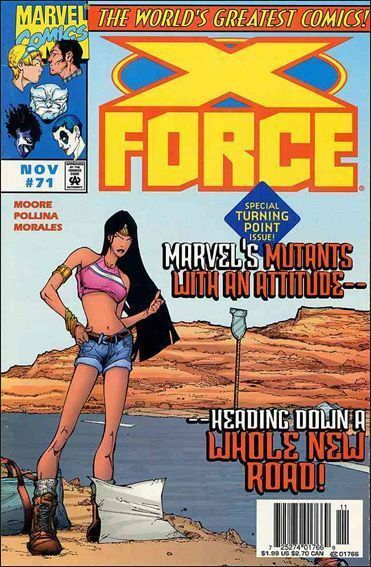 Essentially, X-Force began as a spin-off of the X-Men, at the height of that comics' popularity in the early '90s. There have been many different line-ups over the years, but the one constant has been they are the more militant, down n' dirty version of the X-Men, who will cross the moral lines the X-Men won't. If you want to get yourself acquainted with the team, here are some essential stories to read, some of which may very well influence the cinematic version. In a lot of ways, the original run of X-Force is the epitome of what mainstream superhero comics became in the early '90s, for both good and bad. Lots of big guns, big muscles, aggressive characters, and more of a focus on art than on writing. But this is where the concept of X-Force began, and if you're going to start somewhere, you might as well start at the beginning. In 1990, Rob Liefeld, then a young artist who had taken over Marvel's junior X-Men book The New Mutants with issue #87, realized that the title was running on fumes. As the mutant teens approached 100 issues, they weren't really "new" anymore, and their previous mentor figures Professor X and Magneto had abandoned them. Liefeld realized the book needed a total reinvention. He designed a new mentor for the team, a grizzled cyborg named Cable with a mysterious past, who took the handful of Xavier's students that were left and wrote all but two of them out, then brought in a ton of new characters he created to replace them, and after New Mutants #100, redubbed the team "X-Force." Even though he wasn't a member of the team, one of the original new adversaries for X-Force was Deadpool, who first appeared in New Mutants #98, and was one of the first bad guys the team fought in the earliest days (yes, Deadpool was essentially a bad guy early on). Those earliest X-Force stories are pretty dated now - lots of splash pages with characters not saying a whole lot and running at each other. But there was a crackling energy and fun in those issues, and there is no doubt that Liefeld tapped into something. There's a reason X-Force #1 sold 5 million copies. Say what you want about his art--which gets criticized a lot--the designs of Cable, Deadpool, and Domino were instantly iconic, and have changed very little over the years. There's reason they're all still around. The basic idea of Cable and Domino gathering a team of mutants to turn them into a militant fighting unit, who takes the fight to the bad guys instead of waiting for them to attack? I would use that premise as the jumping off point for any X-Force movie, although I'd probably ditch the idea that they were Xavier's former students. Oh, and obviously, I'd use Deadpool as a team member and not an adversary (I'd say that's a given). Despite the original idea that X-Force would be a more militant X-Men that would take the fight to the bad guys, after Rob Liefeld left the book within the first year to found Image Comics, the title just fell into being another X-Men team book. Eventually, the team stopped working for Cable and went out on their own, and former New Mutants characters that had been written out of the title came back. X-Force then became less about muscles and fights in the late '90s and more about a group of kids with powers trying to figure themselves out. This run on the title isn't talked about as much, but it did produce a memorable story in issues #71-80 of the original run, written by John Francis Moore and illustrated by Adam Pollina. In this road trip story, the team's car is broken down, so Moonstar, Siryn, Warpath, Sunspot, and Meltdown hitch a ride across country with a strange couple named Scooter and Louise. This is a storyline which is way more about young people figuring out who they want to be in life, and where they want to go next, than about big fights and world-ending catastrophes. Once the team realizes they have no mentor, no money, and no real reason for staying together as a team, they find the only real bond holding them together is friendship. While the original run of X-Force comics lacked in characterization, these stories more than make up for that, and finally give the team real personalities beyond just their surface traits and cool designs. Sadly, I don't think this run of issues was ever collected into trade paperback form, so you might have to read these the old fashioned way -- by hunting down back issues at your local comic book shop. Honestly, this run of X-Force should be a bigger influence on Josh Boone's upcoming New Mutants movie than a potential X-Force film, but it's a crucial stepping stone in the evolution of the team regardless. It's worth tracking down those issues and picking them up. Now, it's around this time the X-Force that readers really love gets formed, some fifteen years after the title was first introduced! (Hey, some things take time). This new version of the X-Force team was formed by longtime X-Men leader Cyclops, and kept as a complete secret from the rest of the X-Men. Cyclops tasks Wolverine with gathering the best mutant hunters, trackers, and killers that he knows, including former X-Force members like Warpath, Wolfsbane, and Domino, along with newcomers like Archangel and X-23. Wolverine would forge this unit into a more militaristic black-ops branch of the X-Men, one who is willing to do what the regular X-Men won't - kill their enemies, and leave no trace behind. Creators Craig Kyle, Christopher Yost, and Clayton Crain really found the perfect mix of characters to make the book sing, and they actually fulfilled the long-ago promise of the book, which was the X-Men going after their enemies before they can strike first. Also, having an X-Force team with an all-star line-up of characters like Wolverine, Archangel, and Domino among them only helped elevate the book's popularity. Well, if we are to believe Hugh Jackman, not Wolverine (sadly). But, X-23 is still a member of this team, and everyone loved Dafne Keen's performance in Logan, so why not have her aboard? Archangel was also introduced as part of the team at this point, and after being more or less wasted in X-Men: Apocalypse, this could be a perfect vehicle to redeem that character. Also, actress Maisie Williams is supposed to be introduced as Wolfsbane in New Mutants, but could an older version of her character appear in X-Force as well? There is a lot to be mined from this iteration of the team to be sure. If Craig Kyle and Chris Yost's version of the team proved popular with fans, then this took their popularity to the next level. Writer Rick Remender kept the basic idea of a black-ops/"wetworks" style X-Men team led by Wolverine, and then added fan-favorite X-Men Psylocke and Fantomex to the mix. Maybe most importantly, they finally added Deadpool, the character Rob Liefeld had created along with X-Force way back in '91, as a member of the team. That sure took long enough! Written by Rick Remender and with spectacular art by Jerome Opena, their two-year run on Uncanny X-Force is still the most popular version of the team in the eyes of most fans. What made this group work, according to Remender, was that "this is a group of characters that have had their souls stained by evil forces in the past, a common thread connecting them. They've already made the hard compromises in the past; they've all taken life." Well, that and they look really badass in a team lineup picture together. In these stories, the team has to decide what to do with powerful mutant villain Apocalypse, who has been reborn as an innocent child. The team has to struggle with the moral dilemma of possibly killing an innocent child to prevent the return of a powerful despot. It's all weightier stuff than had been included in any X-Force comics before it, but it proved to be the most interesting and memorable run on the title. After the big screen version of Apocalypse was not greeted with love by most fans, a story about his rebirth might not sit well with most moviegoers. But a team made up of Deadpool, Psylocke, Archangel, and possibly X-23 replacing Wolverine? How can the makers of the X-Force movie not be inspired by that? Which X-Force stories are your personal favorites? Be sure to let us know in the comments below. Science says X-23 is stronger than we might think.